The TUV300 is inspired by the design of a battle tank that lends it a tough, bold & stylish, “true-blue SUV” character. The much-awaited TUV300 has been manufactured at Mahindra’s world-class manufacturing plant in Chakan, Pune, Maharashtra. The TUV300 will be available in the following variants: T4 & T4+, T6, T6+ & T6+ autoSHIFT, T8 & T8 autoSHIFT. September 10, 2015, Pune: Mahindra & Mahindra Ltd. (M&M), India’s leading SUV manufacturer, today unveiled its much-awaited sports utility vehicle (SUV), the TUV300 at Chakan in Pune, Maharashtra. Designed in-house and built on an all-new platform, the design of the TUV300 is inspired by a battle tank which gives it a tough, bold & stylish character. It inherits Mahindra’s legendary tough and rugged DNA while its authentic “true-blue” SUV stance establishes its extraordinary road presence. Available at Mahindra dealerships across India from today, the TUV300 price starts at Rs. 6.90 lac (ex showroom Pune*) for the T4 variant. The TUV300 boasts of uncompromising bold SUV style with a 7-seater (5+2) configuration. The tough, masculine design with its imposing front fascia, overall strong and bold lines, chiselled surfaces, high ground clearance and rear-mounted spare wheel lend the TUV300 cues of a “true-blue” SUV. Among other exterior design highlights are its aggressive bold grille with chrome inserts, static bending headlamps, stylish ski racks and sporty alloy wheels. The interiors of the TUV300 are inviting, modern and premium. With dual tone black & beige interiors, a stylish hexagon-shaped center bezel, piano-black centre fascia, an infotainment system comprising 2 din audio, Bluetooth, USB, AUX and steering-mounted audio and phone controls and the sporty twin pod instrument cluster, the TUV300 is set to exceed expectations. 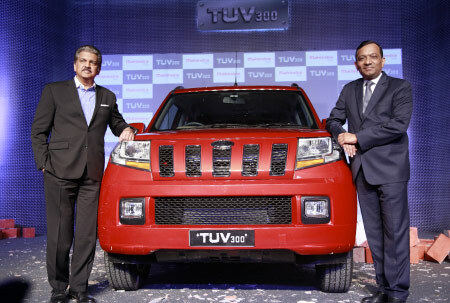 Speaking at the launch, Anand Mahindra, Chairman, Mahindra Group, said, “The launch of the TUV300 is of special significance to the Mahindra Group as it represents our ‘Rise’ philosophy in action. Our development team used alternative thinking to deliver a vehicle with a high level of technology and performance at an unbeatable price. The TUV300 embodies Mahindra’s ’Tough and Rugged’ DNA which makes me confident that it will be a brand creator in its segment and find favour both in India and globally”. TUV300 is powered by the advanced 1.5 litre mHawk80 diesel engine with a 2-stage turbocharger that delivers 61.5 kW (84 Bhp) & best-in-class 230Nm torque. TUV300 is India’s only SUV with autoSHIFT Automated Manual Transmission Technology (AMT), making it effortless to drive. Its first-in-class ECO mode function ensures economical fuel consumption with an ARAI-certified fuel efficiency of 18.49kmpl. Further, the TUV300 gives you a feeling of immense safety, with its toughened high strength steel body shell, hydro-formed crush tips, dual airbags, ABS with EBD and automatic door lock. The TUV300 will be available in 7 variants and 6 attractive shades of Verve Blue, Dynamite Red, Molten Orange, Glacier White, Majestic Silver and Bold Black. The TUV300 is perhaps India’s easiest to drive compact SUV, thanks to its first-in-class ‘autoSHIFT’ technology (Automated Manual Transmission). Its mHawk80 engine, is a 1.5 litre diesel engine with 2-stage turbocharger and delivers 61.5Kw (84bhp) power and best-in-class 230 Nm torque, while its ECO mode function and Micro-Hybrid Technology ensure economic fuel consumption with an ARAI-certified fuel efficiency of 18.49kmpl. Its Cushion Suspension Technology with anti-roll bars and 3rd generation chassis ensure you can enjoy all the toughness of the TUV300 with car-like ride and handling. The TUV300 packs uncompromising style with a 7-seater (5+2) configuration and with the best –in-class headroom, legroom & shoulder room. This, along with 720 litres of generously expandable boot space is unmatched in this segment. The TUV300’s comfortable seats and premium upholstery, with added comfort of driver and co-driver armrests and lumbar support for front row seats make for a perfect package.